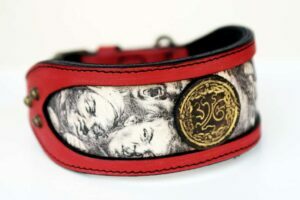 Special dog collars designed for long, elegant, well muscled necks of Ibizan hound, Pharaoh hound dog, Saluki, Borzoi, Azawakh, Portoguese podengo, Cirneco dell’etna, Scottish deerhound, Lurcher, American foxhound, Basenji, Harrier, Sloughi, Afghan hound, Whippet, Italian greyhound. 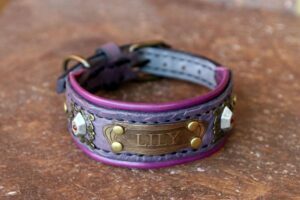 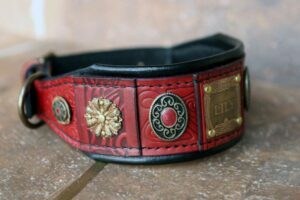 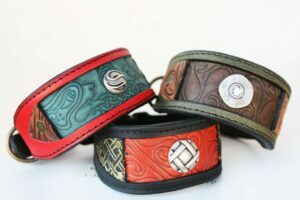 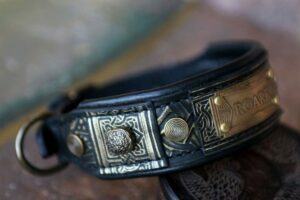 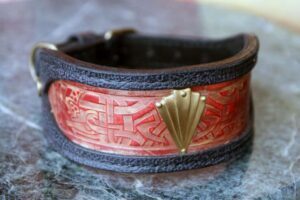 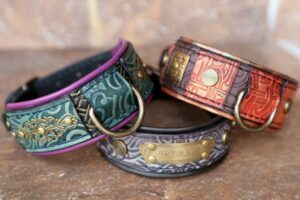 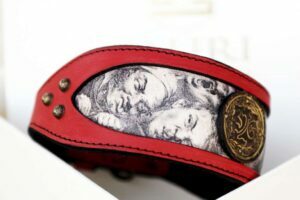 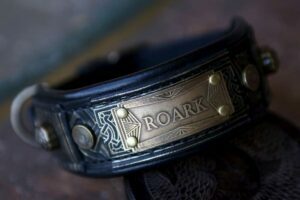 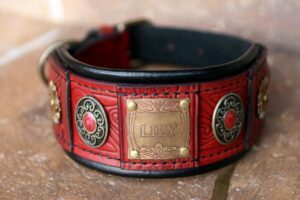 Our leather collars for greyhounds consist of foreground leather, hand printed or embossed underlying leather and different ornaments (brass or silver plated, luxurious, Swarovski crystals, rustic or vintage ornaments). 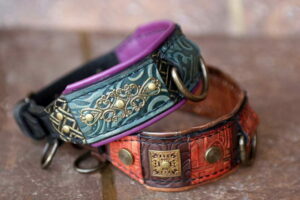 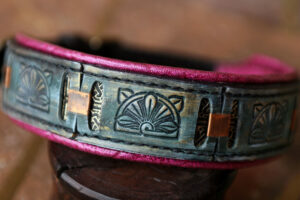 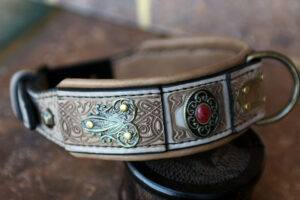 Each collar is uniquely designed and completely hand crafted. 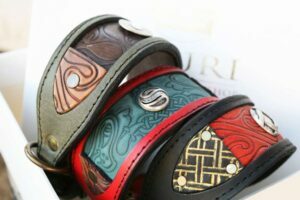 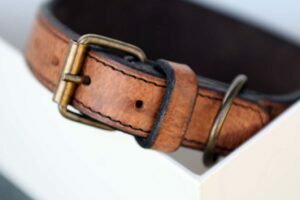 Sauri dog collars are different then 99% collars in the market because we avoid riveting and hand stitch the buckle instead. 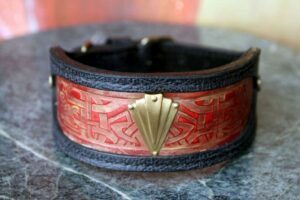 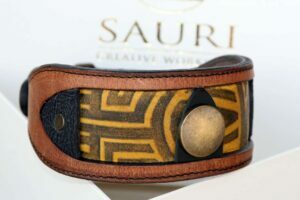 This traditional leather crafting skill makes Sauri collars especially well suited for dogs with fine hair and/or sensitive skin. 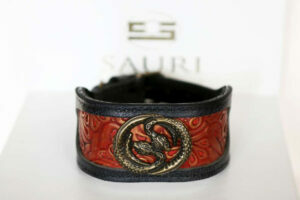 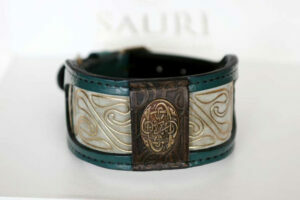 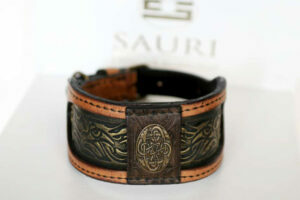 Sauri greyhound collars are made in different sizes (S, M, XS). 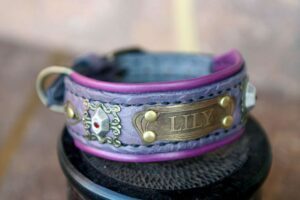 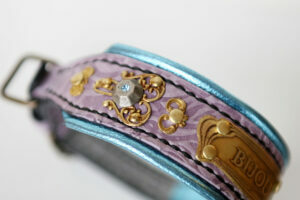 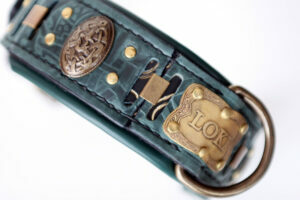 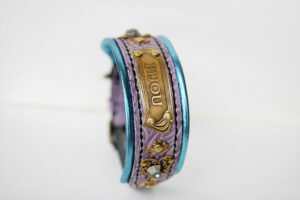 Contact us if you want a customized or personalized design for your elegant dog pal.